When planning a funeral for a United States veteran, you may be eligible to receive a U.S. flag to be draped over the casket or to accompany the urn. This service is provided free of charge and with a great respect for the service provided by the deceased. Although burial flags are most often offered when an individual is having a traditional military funeral or burial, this doesn’t have to be the case. You may be able to receive a flag even if you don’t hold a service at all. Who is Eligible to Receive a Burial Flag? Applications must go through the VA, and are available either online (http://www.vba.va.gov/pubs/forms/VBA-27-2008-ARE.pdf) or through your local post office or funeral home. Most funeral homes are able to facilitate the process and help you apply and locate where you will be issued the flag. They will also instruct you on the proper display of the flag at the funeral, including how it should be draped over the casket. Options for display during burial are usually dependent on whether or not the casket is open (either all the way or partially). For cremation, the flag is usually folded according to the specifications and is placed on display next to the urn. What Do I Do with a Burial Flag after the Funeral? In most cases, the flag is issued to the next of kin, which means a spouse or child of the deceased. The flag can be used as a keepsake, put on display, or otherwise used to commemorate the deceased’s contribution. Rules regarding the care, storage, and disposal of the flag can be obtained from your local VA office. In most cases, you’re asked to not use the flag for any purpose except as a folded display item, and you should avoid marking or altering it in any way. Families who don’t wish to maintain the flag’s care can also donate the burial flag to a VA national cemetery for display on the Avenue of Flags during important holidays. 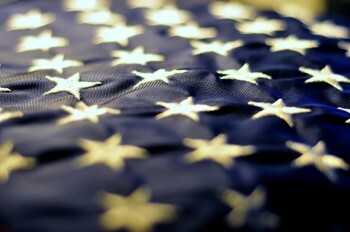 If you have any questions about how to apply for a burial flag or if you are eligible, you can visit the VA online at http://www.cem.va.gov/burial_benefits/burial_flags.asp or call them at 1-800-827-1000. What is the Difference between Burial Insurance and Funeral Insurance?